Sagging Pants? Outrage. Twerking? Outrage. Largest bank in Europe laundering money for drug dealers and terrorist organizations? Crickets. The first two examples above can really kick up an American’s dander. The third was passed over with barely a murmur. Fashion choices that affect no one; dancing fads that look like other dancing fads; someone working the system to get food stamps when they are not needed. Such stories have become social media, and mainstream media obsessions. The publicized word of mouth outrage has been metastatic. It feeds on itself. Outrageously however, our national obsessive outrages point in the wrong direction. Real outrageous stories and happenings fall by the wayside, replaced by the latest absurd outrage d’jour. We need to figure out what is going on, and get outraged over this misplaced outrage. Oh boy. Let us get this out of the way right now. The homophobic baggy pant prison theory/rumor is false. The look evidently did come from the prison system. 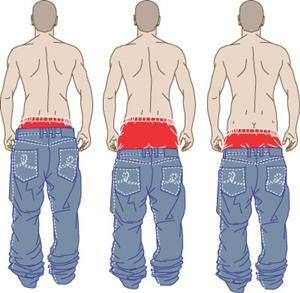 But, all inmates had baggy pants because it is a suicide risk having belts in the clink. Furthermore, EVEN if the homophobe theory was true, who really cares where or how the trend began? How does this justify outlawing someone’s fashion choice? This is unfortunately a rhetorical question. American history is filled with ridiculous, often vicious laws regulating personal choices. See Jim Crow. Outspoken outrage has been turned into legislation, and today’s hyper-connected world may be partly to blame for the ubiquity of such outrage, and hence, for the growth of such laws as well. Social media, and 24 hour news cycles, has allowed outrage to reach a deafening cacophony. Modern media allows, perhaps even encourages, outrage to become obsession, with conspiracy theories, and unsubstantiated rumors (Prison homosexuals) travelling on fiber-optic cables, leaving the truth struggling behind, as it tries to connect with a dial-up modem. This is the world of the internet memes. Memes can produce a falsified, angry narrative hidden behind universally recognized pop-culture humor. This internet guerrilla propaganda depends upon the most absurd of photos, and most flippant of reasoning to make a point, produce a laugh, or create a sneer. Talking points then become repeated verbatim, creating an echo chamber of outrage that feeds upon itself. Memes allow our outrage to be directed at the most daft and harmless social trends. See twerking and Miley Cyrus for the most recent example. Just this previous weekend, Saturday Night Live poked fun at the outrage about Cyrus’ VMA performance, using a nuanced, advanced humor to point to the absurdity of twerk-rage. If you think this is all tongue-in-cheek, just quickly Google “Miley Cyrus Fall of Western Civilization“. You will find people who make such an argument. So now, the big problem. Our contagious, self-spiraling outrage is making Americans truly blind to the forest for the saplings. If you ask Americans how they feel about baggy jeans, or Miley Cyrus twerking, you will get outspoken opinions, outrageous in their passion. But, ask them about the HSBC scandal, and you would most likely get blank stares. What is that, you may be asking? A couple years ago, authorities discovered that HSBC, Europe’s largest bank, had been laundering billions of dollars for Mexican drug cartels, dictatorial regimes, and even Al Qaeda. The United States military have shocked and awed nations and civilians for much less, but HSBC got a relatively light sentence from Washington D.C. The bank had to pay a 1.9 billion fine, which sounds all well and good, until you learn that outrageous total is about 9% of the company’s pretax yearly profit. Oh, and another thing, not ONE manager, VP, CEO, CFO, got jailed, or even fired for this little indiscretion of laundering cash for murderers. Where was the outrage? Where were the memes? Where were the viral videos? Good questions. Such ignorance of the HSBC makes me…well… outraged. I need an answer. Perhaps, just perhaps, this is an example of Freud’s ‘narcissism of small differences’. Maybe we get outraged over someone wearing baggy pants, or stealing an unnecessary 30 dollars from the government each month, or twerking because we are similar to those people. They are us, and we are they with only a couple tweaks of the cultural dial. Maybe HSBC is too big; too nameless. Miley Cyrus was that girl next door who has gone bad. HSBC is a multinational corporation. 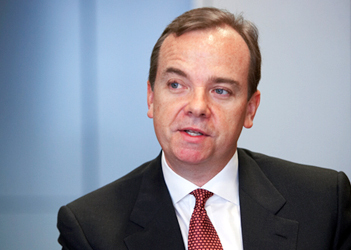 I know what Miley Cyrus looks like; I have no idea what HSBC’s CEO looks like (Stuart Gulliver). We feel powerless attacking a monolithic bank. We feel empowered to shame a kid wearing jeans we don’t like, or a girl dancing in a way we find offensive.